See all those "This content isn't available right now" thing? 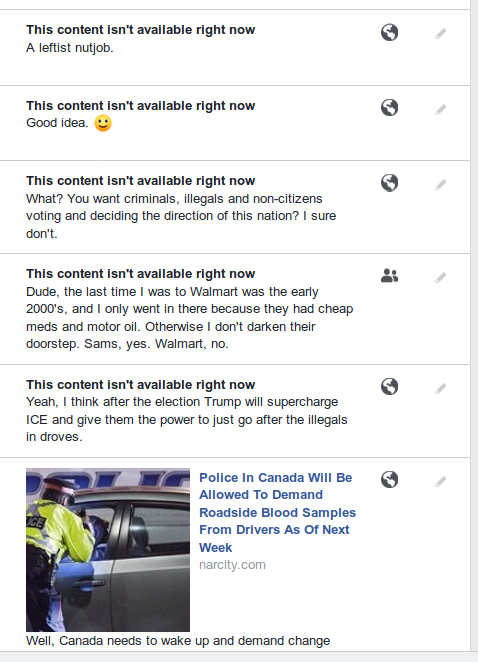 That's not because I got banned, or because the person who posted it did, but rather, that's because the article and/or post was flat out removed by Facebook. Ripped down, banned, and done so either quietly, or very openly in some cases, and the number of posts I saw this happen to was mind blowing. There were just pages of these, all evidence of Facebook's secret war against truth. That's because Facebook doesn't want the truth getting out there, only their twisted brand of "Truth", which is quite often just a pack of lies wrapped in a pretty package. So they're deleting and removing posts like crazy to hide the truth and maintain their leftist narrative. And they're not just deleting links and posts from conservative sources. They're doing this from literally EVERY individual and media source who doesn't fit with their leftist, globalist, anti-truth agenda, even if your source is the MSM. And they claim it's to "protect" people. From what? The truth? From reality? Honestly, I am so seriously done with Facebook, or as some call them, Fascist-Book. And, it probably doesn't help any that they recently got outed as a CIA spying project meant to track your every move, every day. Even more reason to leave and never use them again. Anyhow, rant over. I just wanted to provide this extra proof for those who think I'm fibbing. Trust me, I'm not. They've been purging my account of content that they disagree with like crazy the last two weeks, along with other people as well. Comments, shares, links, posts, etc. If it doesn't fit their leftist "community standards", it either gets shadow banned, I get shadow banned, or they just get outright removed so nobody sees it, period. That's censorship at its finest, akin to China or Russia. Sorry, Facebook, this is America, and we have freedom of speech here, even if you don't want to allow it. And if you're going to suppress my ability to express my freedoms, then I will leave your platform and take all my friends with me, and all of the business and money they brought to you. In time, enough others like myself will too, and you will end up going bankrupt. And all because you wanted to defend your twisted, leftist ideology rather than allowing freedom of speech the way it was meant and envisioned to be. Have fun in the bankruptcy lines. Signed, a ticked off citizen seeking true freedom.